Julie and I had a great time in San Diego visiting with our family. Little Lilly captured our hearts and so we hugged and kissed her a lot. We enjoyed staying with Elisha and Bryan, Benjamin, Zachary and Lillian. They live in a cute, roomy home in El Cajon. 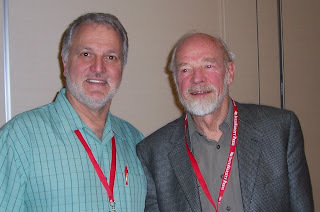 At the National Pastors Convention I got to meet once again Eugene H. Peterson. He has deeply influenced my vocational identity as a pastor. He also wrote the Foreword to my book Jesus the Pastor: Leading Others in the Character and Power of Christ. In my opinion, Eugene Peterson has more radical ideas about the church than many "emerging" leaders do, and his ideas are mined from Scripture, not culture; from traditions, not trends; and from a thoroughly saturated life in the kingdom of God. Two other provocative speakers, for me at least, were Ruth Haley Barton who spoke about the priority of solitude in a leader's life (using Moses' life as the example) and Mark Labberton who spoke and wrote about "the dangerous act of worship" (using Daniel and his three friends as examples). Mark is the pastor of First Presbyterian Church in Berkley, CA, and his ideas are riveting as he welds, on solid biblical ground, worship and justice-bringing into a single, unified reality. As always, it was good to see John Raymond (aka Elvis) of Zondervan. Zondervan is the major sponsor of the National Pastors Convention. John served as executive pastor of Bella Vista Church and is the living expression of a spiritually gifted leader. John is a great companion for the journey into the kingdom of God. Tim and Diane Cosby were also at the conference. Tim serves as the current teaching pastor of Bella Vista Church and is one of the most sensitive, pastorally prophetic pastors that I know. Julie and I have a few days to recoup and then we leave for western Ukraine for two weeks of ministry to young local church leaders. We leave this coming Tuesday. Pray. "In my opinion, Eugene Peterson has more radical ideas about the church than many "emerging" leaders do, and his ideas are mined from Scripture, not culture; from traditions, not trends; and from a thoroughly saturated life in the kingdom of God." That's why I still read him, and will make time to read him, and have grown to appreciate him. The foreword he wrote for you was really good too! So good to hear from you! I am glad you like EHP, too. I am working my way through *Working the Angles* with a friend in the church. Good stuff. It was great to meet you at the NPC (My wife and I interrupted you outside the convention center Wed. morning). I couldn't agree more with your words about Eugene, Ruth, and Mark! Much peace and many blessings on your trip. I hope you made it out before the storms came. John, Nice you could see Eugene Peterson again. And that you folks had such a nice time in San Diego, with family, etc.